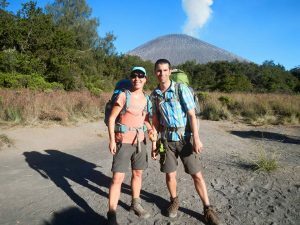 Mount Semeru Trekking Tour Package 3 Days is one of Mount Semeru hiking package option to explore amazing of Semeru Summit has known as the highest volcano in East Java Island. The nearest way to enjoy Mount Semeru trekking is from Surabaya Airport and Malang City. If You are interested to take Semeru volcano hiking 3 days, You must begin your trip from Surabaya or Malang at 04.00 – 05.00 AM and the flight departure at evening around 21.00 – 22.00 PM. For visitors who have reach Surabaya or Malang at day time or afternoon, We suggest You to take Mount Semeru trekking package 4 days. Mount Semeru trekking package provided for visitors who have a hobby for volcano climb challenging high and steep volcano in Java Island Indonesia. Before start hiking to Mount Semeru, Make sure that your body health is good because You will do hiking or climbing confront the steep route before reach Semeru volcano summit and 2 nights camping at Kumbolo Lake and Kalimati camp with the temperature around 05 – 07 degree centigrade. Reach Ranu Pane (parking lot on Semeru area), put your luggage in Local guide house then collect the most important equipments. In the morning, Our tour porter will wake you up to have breakfast and continue enjoy “Ranu Kumbolo Lake Sunrise“ until finish and satisfied then continue hiking to Kalimati (rest area) for 3 hours. After you get Kalimati village, making a tent for camping and break until at midnight. After get the Summit, enjoy the beauty of Sunrise and view from the highest volcano in East Java Island until finish and satisfied. Reach Ranu Pane (Rest Area), Comeback to Surabaya, Malang or Banyuwangi. After You reach your location request, Finish Mount Semeru Trekking Tour package 3 Days 2 Nights. Before You start 3 days 2 nights Mount Semeru trekking, Hope You prepare complete equipments such as Jacket, Gloves, Trekking Pole, Hiking Shoes and Other personal tools because climb to Semeru Summit is more steep than other volcanos in East Java with cold temperature around 01 – 03 degree centigrade. The best time to hike Semeru Volano around January – November, Because between these months still have not rain. Detail information about Semeru Trekking Package Price, accommodation and tour facilities, you can visit Our Contact.